It's September, which means one very important thing: it's more than acceptable to wear my Halloween-inspired wardrobe! Over the years I've accumulated quite the spooky clothing collection, yet nothing compares to Vixen by Micheline Pitt's collaboration with Ben Cooper. Ben Cooper has been creating Halloween masks and costumes for 55 years and Micheline's eye for well-fitting and well-made clothing makes this festive line a match made in heaven. 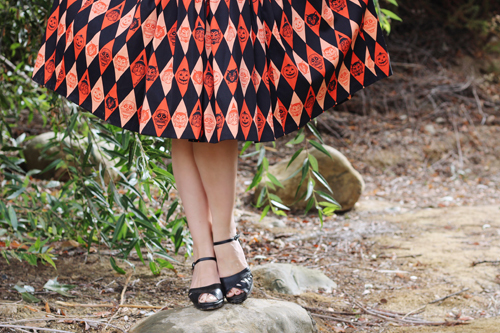 Today I'm talking about the Trick R Treat Vixen swing skirt, but beware, I'll be featuring more of this line closer to Halloween! This Trick R Treat skirt is exactly like the other Vixen swings: a nice, full skirt made with high-quality cotton sateen. It features a wide waistband, back zippered closure, and massive hidden side pockets. The Trick R Treat print was based off the box of one of Ben Cooper's costumes and it's simply perfect! The size chart is very accurate; I went with my usual skirt size of XS and it's just right. 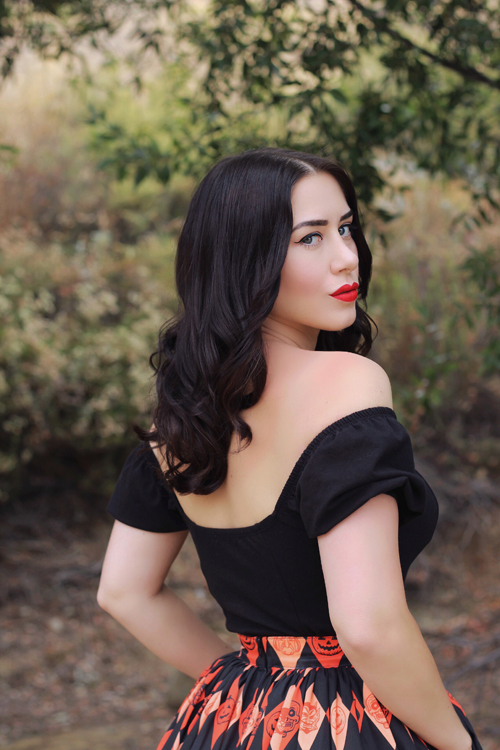 While this skirt is almost sold out on the Vixen website, you can find it almost completely stocked at Unique Vintage or you can check out the stock available at Son of Monsterpalooza this weekend! Today Bianca, my friend Bridgett, and I are enjoying a day at Disneyland/California Adventure. The weather has kind of cooled down to a livable 89 degrees, so we're taking advantage while we can! We're going to stay until closing so we can enjoy the shows and the fireworks. I'll make sure to post all the best moments on my Instagram in case you'd like to follow!